Lately, I'm feeling the need to have busy hands, so last weekend Tall Husband (my trusty technical adviser) and I went shopping for fabric and patterns. As I love hats and one always needs a sun hat in Texas, I bought a Vogue Pattern designed by one of my favorite hat designers, Patricia Underwood. 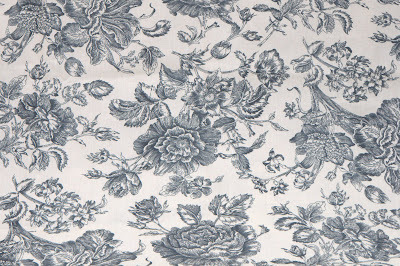 The fabric I chose is a French, black and ecru cotton print that is a home-interiors fabric. You'll see the finished hat later. But don't hold your breath, as I'm an excellent procrastinator and I don't wish any harm to befall you. Note: My last sewing project was a thirty-pound Medieval costume here. That is one heck of a costume you made!!! I know what those type of costumes entail, as I worked at my universities costume shop, and constructed many like the one you made. These all had many layers for the actors to be able to sweat in them and when they were done, they weighed a ton! Bravo to you on that one! this post made me wish we still wore hats all the time!